This month, take a moment to assess your lifestyle. Are you living a heart-friendly life or you are heading for disaster? Preventing heart disease requires attention to many aspects of your life. Consider these heart healthy habits. 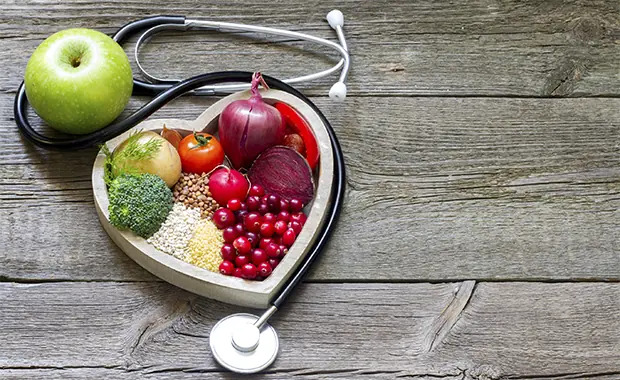 Which ones can you add to your heart-healthy lifestyle? Your heart is a muscle that needs to be worked regularly to stay strong and healthy. Aim for at least 150 minutes of cardiovascular (heart pumping) exercise each week. Keep track of your activity on a calendar and count your weekly minutes. Don't forget strength training twice a week and a relaxing type of exercise at least once a week. Yoga and tai chi are examples of activities that can help you focus on breathing, patience and quieting your mind. Breakfast: Use salsa with your veggie egg scramble. Snack: Keep a piece of fruit on your desk to remind you to eat a healthy snack. Lunch: Always include a veggie soup or a colorful salad. Snack: Keep snack size portions of unsweetened dried fruit and nuts in your desk or purse. Dinner: Steam or roast a mixture of veggies. Save leftovers for a tasty salad topper, to blend into a soup or to serve as a colorful salad. Dessert: Try grilled nectarines, poached pears or baked apples. So tasty! Even if you don't reach the target of eight servings per day, there is still a 4 percent risk reduction per portion of vegetables or fruits that you eat each day. One of the reasons that vegetables and fruits are cardio-protective is that they are full of bioactive plant chemicals, called antioxidants, that protect blood vessels and arteries from the damaging effects of high cholesterol, high blood pressure, high blood glucose, the environment and diets that are high in fat, sugar, and flour. Try to eat a variety of colors every day, even every meal. These are some examples of antioxidant-rich vegetables, fruits, nuts and beans from each of the color categories.